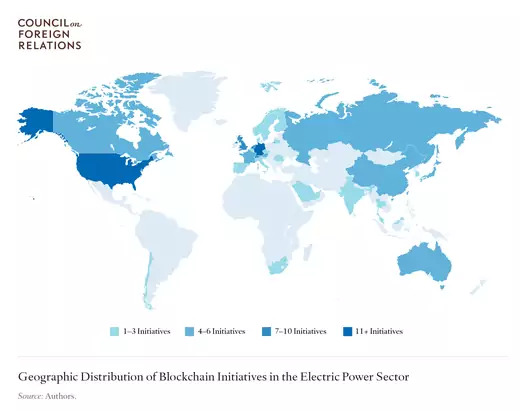 This blog post is co-authored by Varun Sivaram and Madison Freeman, research associate for energy and U.S. foreign policy at the Council on Foreign Relations, and was adapted from a new discussion paper, out today, from the Energy Security and Climate Change Program: “Applying Blockchain Technology to the Electric Power Sector,” by David Livingston, Varun Sivaram, Madison Freeman, and Maximilian Fiege. Electric power systems around the world are rapidly changing. For over a century, these systems have relied largely on centralized, fossil fuel plants to generate electricity and sprawling grids to deliver it to end users. Utilities had a straightforward objective: provide electricity with high reliability and at low costs. But now, governments have new ambitions for electric power systems. Many are requiring these systems to rely heavily on volatile wind and solar power; several are also aiming for a high share of electric vehicles (EVs), which can strain grids. Further complicating the matter, customers are installing their own equipment—from solar panels to batteries and smart appliances—to control their production and consumption of electricity. As utilities struggle to sustain reliable service, meet new policy objectives, and cope with rising complexity, innovators are peddling a putative solution: blockchain technology. Proponents of blockchain technology liken its potential to that of the internet three decades ago. And in 2017, start-up companies raised over $300 million to apply blockchain technology to the energy sector. But so far, little of this potential has been realized. Our new discussion paper aims to add some order to the chaos of blockchain mania. We assembled the largest publicly available dataset of initiatives applying blockchain to the electric power sector. We interviewed dozens of startups, nonprofits, and established firms. And we dove deep into three case studies of leading startups with pilot projects across multiple continents. We had to sift a lot of hype from reality, but we ultimately concluded that blockchain could indeed play an important role in helping manage increasingly complex electric power systems, thanks to its ability to enable swift, frictionless, secure, and transparent transactions (of all sorts—not just transactions of cryptocurrencies such as Bitcoin). Now, most blockchain ventures aim to replace today’s centralized power system with decentralized, peer-to-peer energy trading, for example enabling owners of rooftop solar PV systems to trade with one another in a microgrid configuration. But that is definitely not the application we found most compelling. Electricity Trading Markets: While the original application of blockchain was to facilitate the trading of cryptocurrencies, the technology can also be used to facilitate the trading of electricity. Within this category, two camps have emerged: some initiatives aim to use blockchain to fundamentally reimagine the existing electric power system while others seek to incrementally improve it. Peer-to-Peer Transactions: Peer-to-peer applications are perhaps the most intuitive way to integrate blockchain technology, which has been touted as a way to enable peer-to-peer transfers of information without the need for a central authority. Ambitious startups have launched blockchain initiatives which aim to fundamentally revolutionize the mechanisms of the electric power sector by creating a transparent, immutable ledger to conduct virtual transactions and allow individual homes or businesses to sell electricity generated by distributed batteries or solar panels. Even though this is the most popular application, we expect it to be among the least successful, because it seeks to upend centralized electric power systems rather than managing the complexity of these systems in new and valuable ways. Grid Transactions: A range of other electricity trading applications that relate to electricity trading in the existing electric power system are more likely to gain commercial traction and support from incumbent utilities and regulatory authorities. 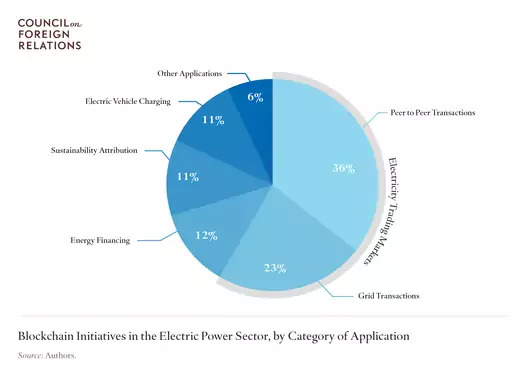 These include projects to reform existing wholesale electricity markets by helping to validate transactions more quickly and cheaply, and to underpin new markets for distributed energy resources to operate in concert as “virtual power plants.” These large-scale grid transactions, in which the power grid remains integral, even if its form and function changes substantially, will probably ultimately be more meaningful to the future of the electric power sector and its ever-increasing complexity. Energy Financing: Some startup initiatives have proposed applications for blockchain which have involved using cryptocurrencies to raise funds for energy projects, overwhelmingly in the clean energy space. Blockchain networks may make it easier for renewable energy projects to raise funds by broadening the pool of potential investors. However, it is unclear whether such a decentralized network is actually necessary to supply the funds needed for renewable energy generation to grow briskly. Sustainability Attribution: One of the most immediate applications of blockchain to the electric sector is its use to record and trade attributes of sustainability, including whether a unit of electricity is renewable and how much emissions resulted from its production. This could help reduce friction, fraud, and errors while expanding the size of regional trading markets for attributes like renewable energy credits or carbon offset credits. If these projects can be scaled up, governments might become better equipped to regulate carbon emissions and encourage the deployment of renewable energy. Electric Vehicles: The rising popularity of electric vehicles (EVs) is blurring the line between the electric power and transportation sectors. However, EVs still face substantial barriers to customer adoption, including the scarcity and complexity of public charging infrastructure. Blockchain networks that enable private owners of charging infrastructure to sell charging services, and initiatives that help streamline and reduce costs of charging, could help enable greater adoption of EVs. In addition, smart contracts could also enable EVs to charge or discharge based on the needs of the electric grid, enabling the vehicles to act as mobile batteries and to help stabilize the grid. 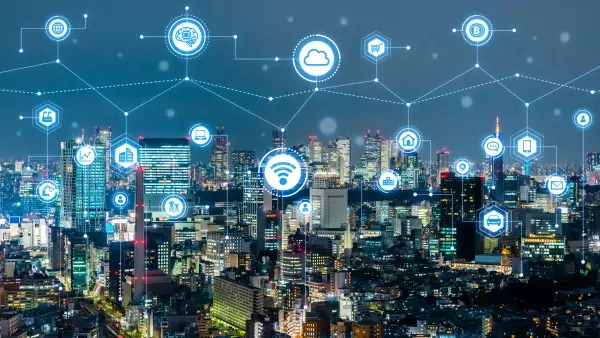 Others: Other applications of blockchain technology have included efforts to manage a range of internet-connected appliances to the grid to help balance the load on the grid during periods of peak demand. Some utilities are seeking to use blockchain networks to better manage their grid infrastructure assets. Regulatory initiatives seek to enable swift and seamless transactions between customers and the electricity retailers of their choice. Finally, other initiatives have sought to apply blockchain technology to enhance the cybersecurity of electric power systems. We concluded the paper with policy recommendations. Because the electric power sector is highly regulated, policymakers will play a crucial role in determining how much of blockchain’s potential can be realized. Unfortunately, blockchain is a foreign concept for many policymakers in the electricity sector – so investing in understanding the technology and its applications is an important first step to effectively creating effective regulation. Policymakers should also support the development of technical standards, and should make it possible for blockchain ventures to set up small-scale demonstration projects through regulatory sandboxes. Read CFR’s new discussion paper, “Applying Blockchain Technology to the Electric Power Sector,” by David Livingston, Varun Sivaram, Madison Freeman, and Maximilian Fiege.